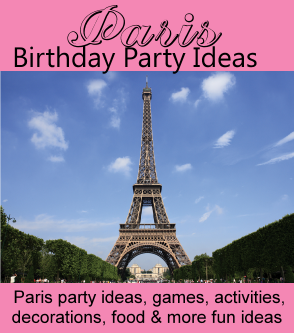 Paris birthday party theme ideas for kids. Fun ideas for a Paris party including invitations, decorations, activities, food, party favors and goody/loot bags. Have a Mime perform during the party. If you can't find, or afford, a professional Mime a good idea is to call your local High School or College drama department and see if some of the students would be willing to perform at the party. Hire a caricature or portrait artist to draw fun portraits of the guests. This would also be a great take home gift or party favor for the guests. Purchase postcards with Paris landmarks on the front and fill in party information on the back. Black or pink cards with pictures of the Eiffel Tower stamped on the front. Blank note cards embellished with Paris themed scrapbook paper or maps of Paris. Use the Flag of France (blue, white, red) either pasted or drawn onto blank cards. Buy a good sized statue of the Eiffel Tower and place it on the floor. Find plastic rings, or make from cardboard and paint them pink, that are large enough so they fit over the top of the Eiffel Tower with plenty of room. Have guests stand back from the Eiffel Tower, about 7 feet, on tape you have placed on the floor. Each guest gets 3 - 5 tries to throw their rings on the Eiffel Tower. You can change it up by starting close to the Tower and then each round moving them back a few feet. There are several ways to decorate for a Paris themed birthday party. Decorating with traditional colors such as blue, white and red (for the France flag), decorate with pastels and flower (Springtime in Paris), or more modern with pink, black and silver. Traditional - Decorate in blue, red and white. Use red/white checkered tablecloths for a Paris street bistro feel. For a springtime in Paris feel fill small wheelbarrows with fresh cut flowers and place them on the party table. For a more modern Paris theme place different sizes of Eiffel Tower statues on the party table and fill in with fresh flowers, feather boas, and/or hat boxes and strings of lights. Paris is known as the "City of Lights". Use strings of mini clear, white or pink Christmas lights and hang them around the party room, weave them through plants, wrap table decorations, and light up the party. Hang Paris city maps on the walls or posters of Monet paintings.